With trucks and trailer-trucks spending that much time on the country’s roads and highways, it comes as no surprise how common truck-related accidents are. The Federal Motor Carrier Safety Administration (FMCSA) reported that in 2009, tractor-trailers and other large trucks were involved in 286,000 crashes resulting to 74,000 injuries and over 3,000 casualties. Out of all those casualties, 76% from large truck collisions were drivers or passengers from passenger vehicles. Despite the growing demand for truck-related transports, Merchant Cash USA dubbed California as one of the worst states to own a trucking company and or be a truck driver. This is largely attributed to difficulty in adapting to new regulations and smaller companies struggling to keep up with larger trucking conglomerates. It can be a challenge to compete when it comes to fare hikes, hiring new personnel, and acquiring new equipment and maintenance. In addition to the mounting costs, small to medium truck business owners, are the unavoidable truck-related accidents. In 2010, the National Highway Transportation Safety Administration (NHTSA) reported California as the second most dangerous state to drive in, with 2,715 fatal traffic accidents. Out of that number, 235 involved a commercial truck. With these statistics of car crashes in mind, it is clear that prioritizing road safety not only prevents loss of life, it also helps small companies avoid mounting costs from accidents that could otherwise be avoided with preventive maintenance and extra vigilance when traveling. 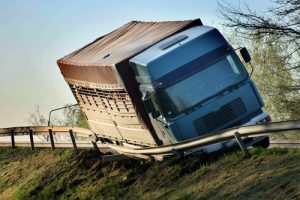 Boulder Personal Injury Attorney Tenge Law, a Colorado-based law firm outlines in this infographic some useful information and steps to take to veer away from and lower the chances of tractor trailer and other truck-related accidents. They identified that one of the leading causes of truck-related accidents is human error, and that with a few preventive measures in place, can be largely avoided. The FMCSA detailed that the most common causes in truck-related accidents result from driver critical reasons. Fatigue, falling asleep on the wheel, disabled by seizures, heart attack or other forms of physical impairment leads to non-performance of the driver, resulting to crashes. Bad decision-making or miscalculations also play a large role in causing these accidents. If a driver is moving too fast for the driving conditions or the speed of other vehicles around him is too fast, it may be difficult to make precise calculations. Another common cause for accidents is distraction. The driver’s attention was on the phone, was inattentive, or distracted by something inside or outside the vehicle, impairing his ability to swiftly respond to the situation of the road. To counter this, strictly adhering to the commercial driver hour restrictions of 11 hours plays an important role in making sure the driver is sharp and can make split-second decisions to dodge possible collisions. Pulling off the road to take a quick shut eye instead of snoozing behind the wheel is also sound advice every trucker should follow. Aside from the safety measures truck drivers can adapt, the infographic also lists steps that passenger vehicles can follow on how to properly drive alongside trucks and how to drive beside a large vehicle with limited visibility. Keeping in mind the limited vision and different response time truckers have, passenger vehicles should be mindful about being predictable when driving near or with large trucks. Always using turn signals when passing and avoiding abruptly changing lanes help truck drivers better traverse the road and respond accordingly to the driving intentions of smaller cars around them. Knowing the where the blind spots also contribute greatly to road safety. These blind spots or “no zones” can be found at the rear of the truck, beside it, and the connecting point between the truck and trailer. Passenger drivers should always be watchful of these areas and consistently drive away from them. A good rule of thumb that every passenger driver could follow is making sure they can see the driver in the truck’s side mirrors. This means the driver can also see you and you can convey your intention whether to turn, slow down, or overtake. Rain, snow, strong winds, and tricky terrain are also behind many road accidents. Make sure to have the right gear equipped based on the weather. Tire chains are especially helpful in mountainous regions and snowy roads. Adjust speed to allow truck drivers more braking capabilities. A passenger driver going uphill with a truck should give the larger vehicle a wider berth in case the truck driver struggles to shift gears and the large vehicle drifts backwards. Properly and regularly maintaining vehicles to prevent mechanical failures go a long way in road safety. Routine brake checkup and maintenance greatly helps in high-demand panic situations when the driver need to stop abruptly. The brakes must be strong enough to avert disaster. Keeping the tires, wheels, and hub in top shape prevents runoff crashes where wheels come off vehicles, and loss of control due to tread detachments. Other factors that can contribute to tread detachments are underinflation, overloading, tire age, and internal rusting. Aside from all these safety measures, regularly reviewing the Commercial Drivers’ License (CDL) Manual is equally important as it details the standard care for safe truck operations. There are many precautions both truck drivers and passenger drivers can take to avoid accidents to prevent loss of life and avertable costs and delay from road accidents. Even with the challenges the trucking in industry in California faces, there are many opportunities for improvement and growth for small and medium trucking businesses. And with a few tweaks in the system, they can be at par or profit alongside bigger trucking companies.